Longitudinal or pull in is sometimes referred to as a cigarette wrap. This is where the tape is applied longitudinally and folded over its self to form a typical 25% overlap. This can be applied either with the foil side facing inward or outward, relative to the cable core. J-Fold: This type of fold allows for a metal-to-metal contact. Without metal-to-metal contact the signal could escape and cause interference. Z-Fold: Is a combination of a metal-to-metal contact with the addition of an isolation fold. 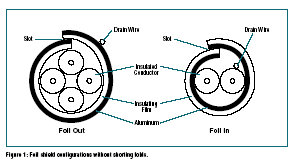 This type of design is typically used in individually shielded pair cables where total shield isolation is required between the pairs.